Parallels, the company known for running the Apps in different platforms virtually. In the beginning, it has brought all Windows Applications to the Mac System. After that, It went further to bring all Windows Apps and Mac Applications to the iPad with parallels Access. What is Parallels Access 2.0? In this history, they have added another milestone with Parallels Access 2.0 which is launched on Tuesday. They have launched this App in the Google play store and App store in few hours before. With the help of Parallels access 2.0, anyone can run the Windows, Mac Apps in their Android Phone and Tablet or in iPhone. Even, you can access your files in your computer and Mac. Parallels have the simple, fast and Most reliable Remote accessing Technology. Once You installed this App, you are ready to access your computer without touching the keyboard or you don’t need to be there. Just Open the parallels Access to open important files and office mails in your Android Phone or iPad. For example, If you are travelling with your family for a vacation, but you have to access your computer to get the important business info, What would you do in this situation? Don’t be panic. Login to your Parallels account and access your computer virtually from anywhere around the globe. Parallels have the 14 years of experience in this technology and they are smart enough to fit your computer’s screen in your Hand-held device. They have introduced the magnifying glass in this version to see your desktop clearly in your phone. You can open any Windows and Mac Apps with one Tap. Like the desktop, Quickly navigate to another Desktop Application in your Smartphone. In Parallels, You can get the complete Desktop keyboard to use the Desktop Apps effectively. 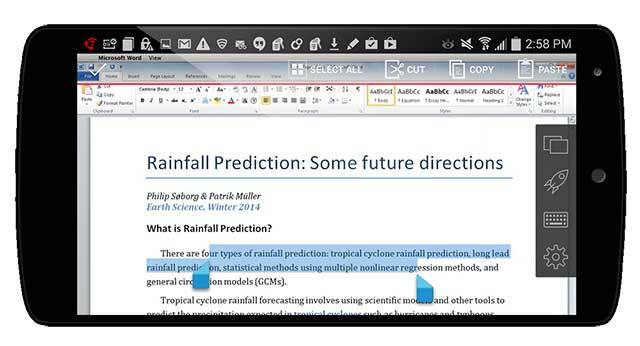 Parallels Access 2.0 has the file browser that allows you to open and edit the Document from your Desktop computer. Don’t need to fight with smartphone when you want to Edit the content. The smart technology gives you the precise selection, copying and pasting the text. With One Finger Lock, Anyone can easily drag the Photos from Parallels your Android Phone. To access the Desktop Computer effectively, You shouldn’t put your computer on the sleep Mode. However, in this version 2.0, they have introduced the ‘Wake On LAN’ that will wake your computer from sleep mode wirelessly. For your reference this feature is not 100% fool-proof. However, This feature is handy when you want to access your Desktop in an emergency situation. It has added many security features in this version. In remote accessing technology, you can’t secure the physical device that you access remotely. In Parallels Access 2.0, While you access your computer, you can completely blackout your computer screen and mute Speakers. Also, You have to login to your computer like you would in person while you access it. The network speed is the biggest concern in the Remote accessing technology. The Parallels will work even on the slowest 3G networks. Currently, Parallels Access 2.0 allows you to access five computers remotely with an unlimited number of iPhone and Android devices. It will cost you $19.99 for a year. If you subscribe before June 30, You can get two years period for $29.99. They are also launching the Parallels for Business which will have more layers of security and Admin features. That will cost a $49.99 for a year to access five computers. Get First Day Performance and Smoothness of Your Android Again with Greenify!